Time again for our new-ish monthly feature of our current favorite blogs. Don't forget, you can access the links to our monthly blog faves on the right side of the blog all month long. 1. The Bloggess: Pee your pants funny. Refreshingly honest. 2. Emma Dime: Get your daily dose of pretty with a side of knitting. 3. A Beautiful Mess: You'll want to be her best friend too. 4. Miss Moss: Lots of eye candy. 5. House of Turquoise: Duh. Enjoy! And be sure to send us suggestions! 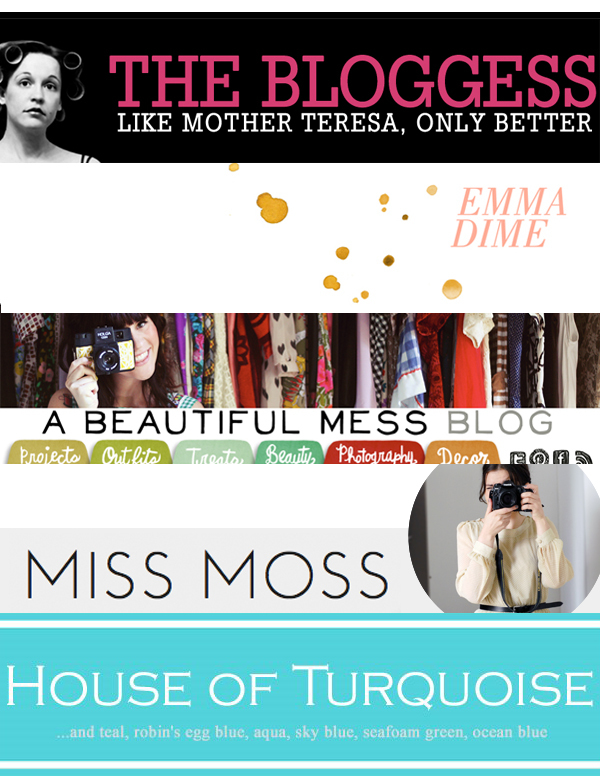 Which blogs are you reading these days? Thanks for sharing! I will check out some of these new blogs! I LOVE A Beautiful Mess - Elsie is just so inspiring and amazingly talented! Would love you to check out my blog too!